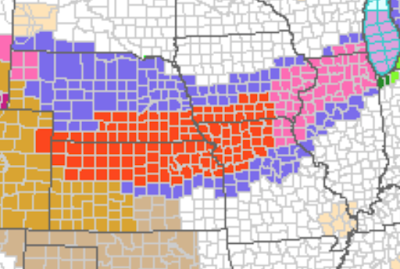 The blizzard warning now includes Kansas City and Topeka, Kansas, as well as Kansas City and Warrensburg, Missouri. Interstate 70 is now included in a blizzard warning from Burlington, Colorado, across the entire length of Kansas to Lafayette, Missouri. Denver International Airport just reported a wind gust of 60 mph.